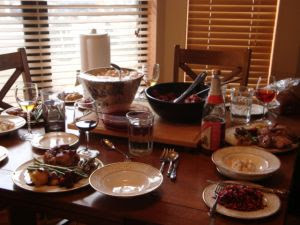 A table full of food and a happy family – that’s what I love. During the summer, one of my favorite simple pleasures is cooking. I love to cook when I have the time. It’s no fun to rush home from work and try to figure out if you have all the ingredients you need to throw something together. And the prospect of cleaning up holds no attraction when you have a stack of papers to grade and you know that 6:00 will come really early tomorrow morning. But in the summer, first – I have a college boy home. My husband loves it when I cook especially for him, but there’s something about, “Oh, Mom – this is so good!” that just warms my heart. And in the summer, this teacher is gets to set her own schedule, pretty much. I have time to plan and shop and pore over recipes and cook family favorites – and they love eating it. This week, two of their favorites were Chicken Cacciatore and Beef Bourguinon. And tonight? Well, I haven’t decided. Pretty soon I'll be poring over recipes. The days of six around the table are gone (except for holidays), but as each boy left, we stayed committed to time together around the table. The boys talk about how few of their friends’ families ate dinner together. They say they’re so glad we did. I’m glad we did, too – and glad we still will, no matter how many gather round. How do you feel about cooking? And family meals? I love this too, Laura. We usually try out new recipes on Sundays and one of my favorite simple pleasures is staying home and cooking with my family. We have two young adult children who both study nearby so they're still home but most days are busy. Friday family dinners out are fun but cooking together is still my favorite. Thanks for stopping by via Simple Pleasures. Much love! Just got a glimpse of your book. I happen to have a profound compassion for the heart of a mother as well. Sounds like a wonderful book. Will be back to read some more soon. Oh, I get this one completely! When I taught school full time, I tried a hundred different ways to fix the "no fun" cooking problem, and I never got a hold of it. When I was home, it made all the difference in the world. I also understand about cooking for your college son home for the summer. This is a great simple pleasure! like you, i love making people happy with food and cooking when i have time. and yes. we eat family dinnr together even if it's fst food in the car on the way to a ballfield! and in the summer we have family lunch as well my boys fixed it today. loving this break. I love to cook, if someone else will clean. :P Family meals are where we learned what was going on. A treasure! Cooking isn't my favorite- nor is it my least favorite. I can enjoy it - depending on what I'm doing. LOVE the whole family at the dinner table. LOVE IT! That's the best. I love to see my table surrounded by my loved ones! Family meals together truly make for strong ties! Cooking for loved ones is certainly a simple pleasure. Such love goes into it. Thanks for linking up and have a blessed summer.